In order to truly get excited about your project, you sometimes need a clearer vision of what the end result will look like. At Topaz Design Group, we go out of our way to paint the picture for how everything will come together. With our 3D Design service, we use our own software to create a specialized layout for your design project. 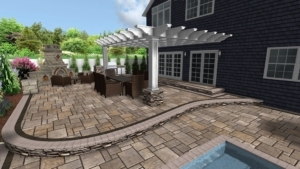 This service is particularly useful for homeowners who are incorporating several features into their Long Island landscape, such as patios, outdoor kitchens, swimming pools, etc. Using the latest innovative software, our landscape designers are proud to offer this service to help homeowners feel truly enthusiastic about their upcoming projects. For more information regarding 3D Design services, or to begin your own outdoor project, complete our online form today.